This starts with a nice few scenes about the 'British Is Best' flag and despite all Arthur's proud to be British attitude from the start of this episode, he still has a map of Italy behind him on the wall at the the car lot caravan. The story then quickly moves on to the fact that 'er indoors has disappeared. This episode is very well constructed to conceal the identity of 'er indoors from start to finish. Although the majority of the episode is about her we find out very little about her, only that she has a sister referred to as simply 'er in Norfolk. We also learn that Ray's middle name is Albert (used at court). This is the second time Bert & Doreen appear as Morley goes around to interview them. Billy from Bradford is down as Arthur tries to sell him very humourous micro chip marvels in the form of timers that play three popular tunes - these are one of my favorite gadgets that Arthur has for sale throughout the entire series. A few notable faces in this one - firstly Kevin McNally as Mr Richards the jobsworth council planning enforcement officer. He is of course Kevin Sperring who wrote nine Ray Daley episodes, the first of which having been the previous episode 'A Bouquet Of Barbed Wine'. George Cole would later appear with Kevin McNally in the BBC sitcom 'Dad' and talks a little bit about Kevin and working him in his 'The World Was My Lobster' autobiography. Then we see a very young Philip Glenister as reporter Greg Hunter. Also appearing is Cherry Gillespie who plays the hairdresser that reports 'er indoors missing to Morley. She was member of Pan's People on Top Of The Pops from 1972 to 1976 and the shortlived 'Ruby Flipper' that replaced them briefly in 1976 before Legs & Co. took over. 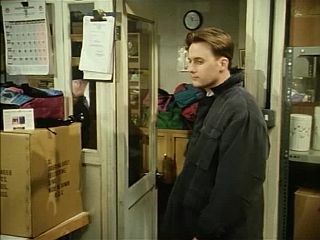 A small clue on the filming date: the calendar on the door of Arthur's office of the lockup I believe could be from December 1990 (see picture - unless its a prop?). Point of interest for old school retro computing lovers - Arthur's bank manager has an Amstrad 1640HD on his desk. These came with a humongous 20Mb hard disk and superseded the earlier 1512DD model which has two floppy drives and a staggering 512k of memory - more info: www.old-computers.com/MUSEUM/computer.asp?c=19&st=1. Sell to keep well - get all the British ones down the front. About 'er indoors: When she's aggravated, I get aggravation. In court: Mrs Worship, one cannot hold a dialogue with a man who is permanently cocking a deaf'un. In court: I have led a blameless life. Overall, although not the best episode of Minder ever - this is a very enjoyable one with sadly only a few laughs along the way. Yes, same here. One of my favourite Ray eps. It was typical Arthur, unleashed. The one liners and 'arthurisms' ran thick and fast in it, absolutely hilarious. 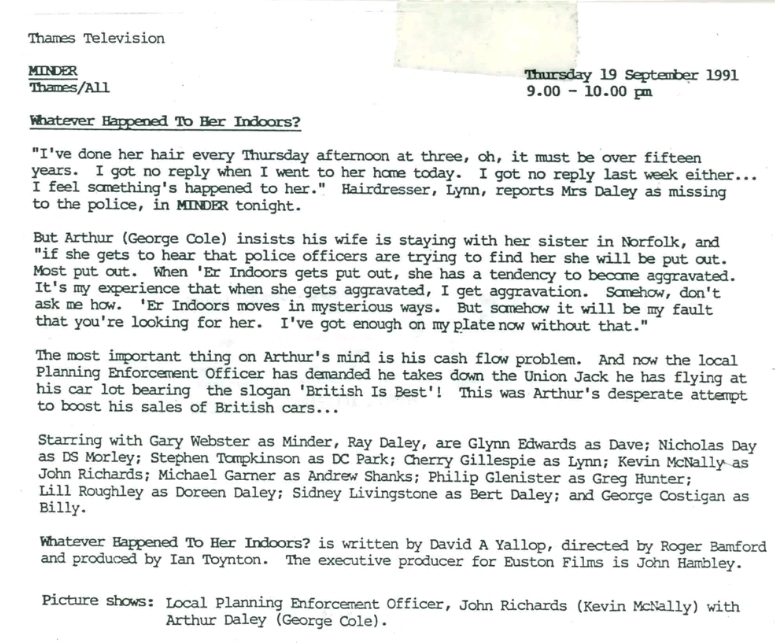 I also like how the Police are on Arthurs case the whole episode about his Wife disappearing and he seems oblivious to it all, brilliant. Glad to hear that you are getting back into these Daz. I thought this episode was brilliant! I really enjoyed Arthur's opportunistic patriotism and his court room antics.. I also like the clever way next to nothing is revealed about 'Er Indoors despite most of the episode being about her. I've only seen three Ray episodes but so far this is my favorite. Trust me PR1, you have some real treats ahead. George Cole played a blinder in this, the mannerisms and one liners are great to watch. Er indoors missed by everybody in this episode apart from Arthur. Really hope last orders, with heart attack is on ITV4 soon. Last orders hopefully showing soon ITV4. I really enjoyed this one. Two good story strands with the disappearance of Her Indoors and the flag. George was on top form here, as though he knew that it was going to be ok without Dennis. 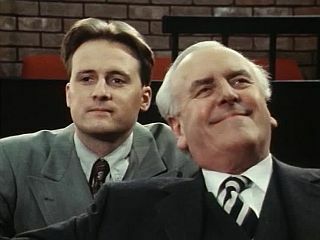 The bank manager was played by Michael Garner, soon to become Geoffrey 'Poison' Pearce in London's Burning and had also appeared in 'Another Bride, Another Groom' in series 3. 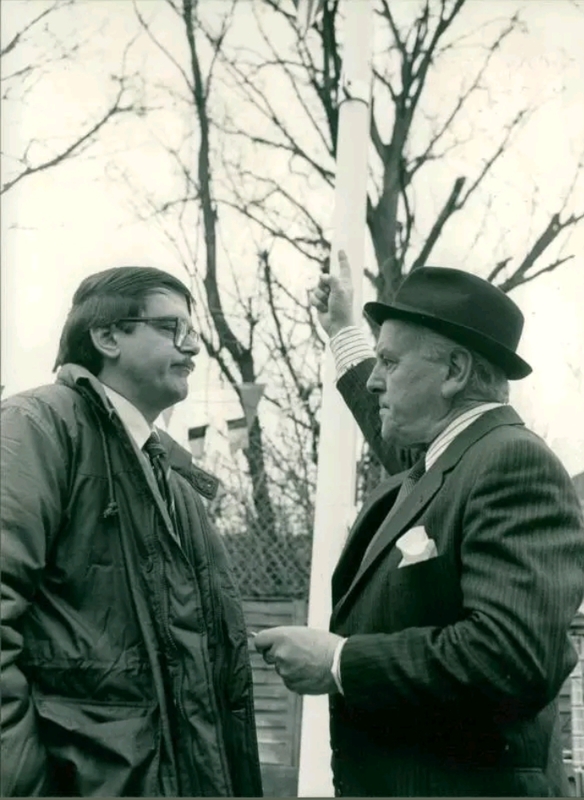 I remember seeing a trailer on Thames of forthcoming shows for Autum 1991 and they showed a clip of Minder being filmed at the car lot, it was snowing and George Cole was clearly feeling the cold weather. It was probably from this episode. Would love to see that again. I remember that swainy,would be good to see again,but don’t think we’ve much hope. Well I keep searching YouTube through tons of ITV adverts of 1991. New (old) stuff turns up every now & then so you never know. The Internet: everything you want is probably out there, you just need to find it (jno 1995) - you never know what is 'around the corner'.